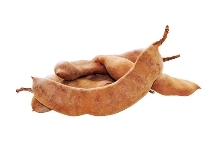 Tamarind pulp is brown and soft inside a brown pod. The pulp is sour when its young, but it’s getting sweeter when it’s getting older. You can see a lot of sweet tamarind in the box at the supermarket. They are really sweet and tasteful. But for many dishes, we use young tamarind to get the sour taste. In combination with turmeric, this pulp has unlimited health benefits. You can make a simple and tasteful drinks with these two healthy spices, it keeps you body fresh and active. And it's certainly very important spice for women, its lower the menstruation pain. Tamarind pulp is a great source of vitamins such as vitamin B and C. This remarkable pulp is also a good source of antioxidants, fiber, potassium, magnesium and other nutrient. You can also use this to reduces fever and very effective against colds. 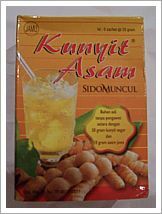 In Indonesia we have a drinks call kunyit asam (means literally turmeric tamarind) from Sidomuncul. This recipe was practice for the first time inside the Keraton, the Javanese palace. This drink has a lot of benefits especially for women. This could be use to take care for all women problems such as facilitate menstruation. It helps to make your skin very soft, keep the body slim and fresh. It helps your metabolism and digestion, and it helps eliminate the bad odor. The curcumin, the most important component of turmeric has a function as antioxidants which can protect your body cells from free radical damage. The drinks taste sweet and pleasant for your stomach if you use hot water. During menstruation period, this drink can be a very enjoyable. The smells of the drinks can hold you back from drinking it, its smell like bitter turmeric (which logic of course), but ignore that. Try it; it’s really a tasty drinks and good for your health.